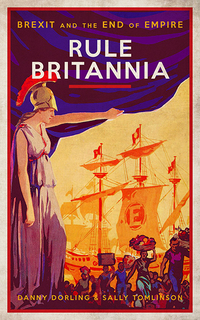 The British empire may strike many of us as distant history that has no more than a marginal impact on our 21st-century lives. But we can’t really understand Brexit — the British move to exit the European Union — without understanding how that empire ended and, more pointedly, how Britain’s rich reacted to that demise. Two scholars at the University of Oxford, Sally Tomlinson and Danny Dorling, have an incisive new book out that explores the chain of events that have brought us to Brexit. This excerpt from that book, Rule Britannia: Brexit and the End of Empire (Biteback, 2019), offers a historical perspective that seldom informs our daily news doses on the latest in Brexit maneuvering. Partly, if not largely, because of failing to come to terms with its loss of a huge empire, the UK had been ramping up economic inequality since the late 1970s, reaching a point where the gap between rich and poor in Britain was wider than in any other European country. When India, and then most colonies in Africa, won their freedom, the British rich found themselves suddenly becoming much poorer. They blamed the trade unions and socialists in the 1970s. To try to maintain their position, from 1979 onwards they cut the pay of the poorest in a myriad of ways and vilified immigrants in the newspapers they owned or influenced, while managing to hold on to some of the pomp and ceremony that their imperial grandparents had enjoyed. Something had to break, and, in the end, it was a break with the EU — it was Brexit. It is true that Brexit was partly the language of the unheard — the masses cocking a snook at the demands of their overlords — and there were some who actually believed the propaganda that problems in health, housing, and education were due to immigrants, and some who really thought “their” country was being taken over by colonial and EU immigrants, by refugees from anywhere, or even by Islam. But there were many others who voted Leave out of hope. They just hoped for something better than what they had. The British had been distracted from the rise in inequality and the consequent poverty that grew with it by decades of innuendo and then outright propaganda suggesting that immigration was the main source of most of their woes. Without immigrants, they were told, there would be good jobs for all. Then they were told, at first in whispers, and later through tabloid headlines, that without immigrants their children could get into that good school, or the school they currently go to would not be so bad. Without immigrants, they could live in the house of their dreams, a home currently occupied by immigrants who have jumped the queue and taken their birthright. “We” (always “we,” always “us”) need to cap net immigration to the “tens of thousands” and then all will be so much better. All this was said to distract people from looking at who was actually becoming much wealthier and who was funding a political party to ensure that the already wealthy could hoard even more in future.